Originally designed by Remington Arms as a special purposes cartridge for America’s special operations forces, the 6.8 Special is a perfect blend between sub-moa accuracy and sheer stopping power. 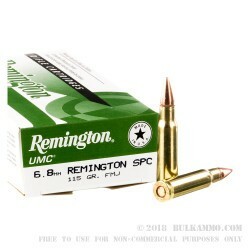 The Remington 115gr 6.8 Special MC is the original round used by special operators engaged in combat today, and is one of the most lethal rounds ever chambered in the history of modern warfare. The Remington 115gr 6.8 SPC MC features a solid lead core embedded within a thick copper jacket. The smooth copper profile of the bullets exterior jacket provides for an exceptionally aerodynamic flight, and is capable of sustaining super sonic flight out to nearly 700 yards and beyond. The non-expanding hollow point cavity helps to prevent the bullet from yawing during acceleration, and at a velocity of 2,625 feet per second, the Remington 115gr 6.8 Special MC delivers everything that performance .223 ammunition can deliver and so much more. For military operators and competitive shooters looking for one of the most well balanced rounds within the carbine market, the Remington 115gr 6.8 Special MC is your ultimate solution. Q: Can this round be used in a suppressed sbr? Posted On: 6/9/18 By: Mike D.
A: Yes, but the round will not be subsonic. 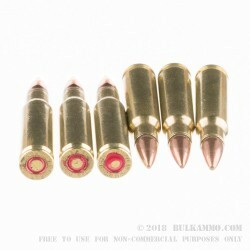 Q: Are these non magnetic projectiles for use on indoor ranges? 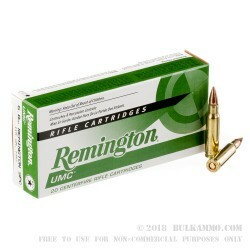 A: Hello Steven, Remington UMC loads their ammunition with a standard copper jacketed lead core projectile that contains no steel. 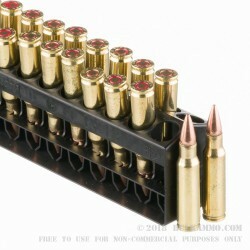 This ammunition should have no issues passing a magnet test.